Shinjuku City celebrated its seventieth anniversary on March 15 this year. To commemorate this milestone event, it has published a magazine entitled The Shinjuku “Colors” Story: The Intersection of People and Time. 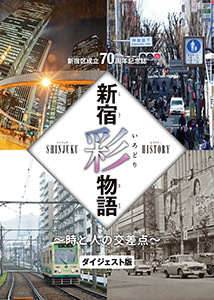 The magazine describes the history of Shinjuku City through text, photographs and illustrations. It includes interviews with people associated with our city, and offers information on Shinjuku’s most attractive qualities. The magazine is available for sale, and you can also view the digital digest edition (in Japanese, English, Chinese and Korean) and a chronology of the city on the Shinjuku City website. The number of copies is limited.